Boston, MA. Editor: H.W. Dresser, editor and manager. 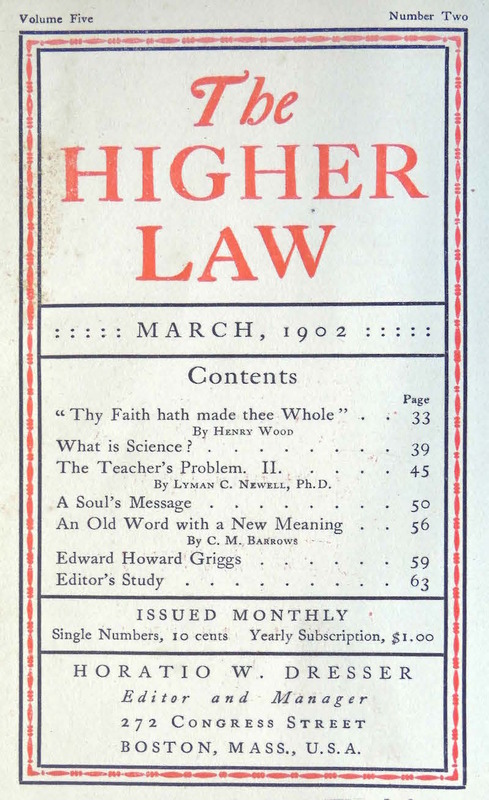 5/2, in the Skidmore Library, Lily Dale, is March 1902, and the year the journal began is derived from that. Contributions by Dresser, Ernest Wood, Lyman C. Newell, et al. Less blatantly commercial than many of its contemporaries, the journal still found place for full-page advertisements for Dresser's books and his Correspondence Course, and for Evelyn Arthur See's The Shrine: A Healing Home and School in the Higher Life, in Kalamazoo, Michigan. Noted in "List of Advance Thought Publications," The New Cycle, March 1900, 159-60., and advertised in The Life, January 1902. Skidmore, Lily Dale (5/2, March 1902).